Facebook's new profile layout, Timeline, is currently rolling out to users worldwide and promises to turn your Facebook account into an online scrapbook. You can use Timeline to resurface past Facebook activity and highlight important moments in your life, including important events that happened before you joined Facebook. "Timeline is the story of your life...a new way to express who you are," Facebook CEO Mark Zuckerberg said in September announcing the new feature. If you've entered when you graduated high school or college, when you got married, when your first child was born or when you started a new job, all that data will show up in your Timeline. 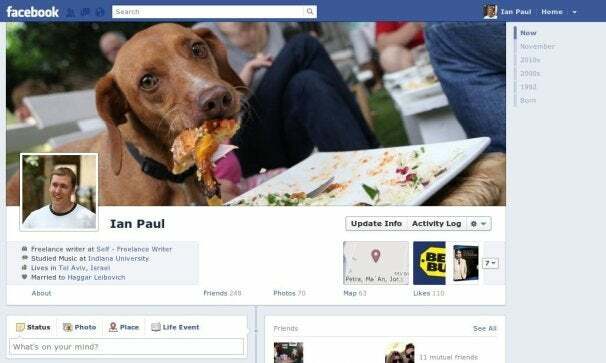 You can also go back and add photos and captions to important past events, or remove particularly embarrassing photos or other content from your new profile page. Timeline is a very interesting way to experience Facebook and a great way to look at your past activity on the social network. But the new Timeline feature includes privacy implications that may give some users pause. Timeline will roll out to you in one of three ways: You can activate it right now by going to Facebook.com/timeline. Alternatively, you can wait for a notification to appear in your Facebook home page and choose to activate the new profile then. Or, if you want to resist as long as possible, you can do nothing and eventually Facebook will switch over your profile for you. Whichever way you decide to do it, once Timeline rolls out to your account you will have seven days to review your Facebook Timeline before it goes live.